Handcrafted from wood, this white lighthouse comes decorated with nautical netting, seashells and a starfish. Perfect for a beach theme wedding or seaside event. OUT OF STOCK: Sorry, we are currently sold out of the 'Seaside Lighthouse Beach Favor*'. If you have further questions, please call our customer loyalty team at 1-800-793-3924. Cast a memory to last a lifetime with our gorgeous Seaside Lighthouse Beach Favor. This unique wooden favor is designed in the shape of an authentic lighthouse, complete with nautical netting, seashells and a starfish. One side of the lighthouse displays a silver plaque that reads Beach and the other is left blank for you to add your own free personalization. 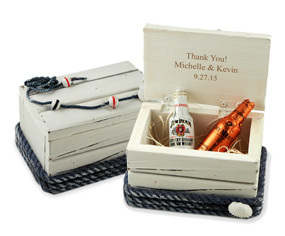 Give these out to each of your guests at your seaside event or destination wedding. The white wood goes beautifully with any surfside occasion and complements every color perfectly. Our Seaside Lighthouse Beach Favor is the perfect addition to your oceanfront celebration. Set one at each table and adorn with a splash of shimmering sea glass or miniature seashells. Use these as your centerpieces and decorate the table with other great nautical items. Use ourSealife Beach Napkin Rings at each place setting or place our Metal Sailboat Favors in front of each seat to keep the nautical theme going. Put one of our custom Personalized Wood Treasure Chests next to each Seaside Lighthouse Beach Favor to create the perfect surf ensemble. 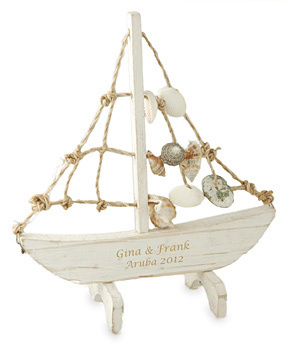 Look through our Beach Wedding Favors pages to find these items and many other amazing ways to accent your decorations. Our Seaside Lighthouse Beach Favor makes the perfect addition to any event that celebrates the oceans allure. Whether you are having an anniversary party, a birthday, or even a baby shower, consider using this inspiring piece to light up the event in style! Children will love the authenticity of the Seaside Lighthouse Beach Favor. Throw a pirate themed party and give each child their very own lighthouse to take home. Decorate your venue with several of these creative decorations and let all of your guests bask in the glow of the sea. The Seaside Lighthouse Beach Favor is sure to make a wave of excitement at any celebration!